The Dev team has been hard at work creating “collections” (emotes, pets, etc.) and felt that Stable-masters would be a welcome addition. Unlike the other “collections”, Stable-master is not just for the completionist; it is also useful for finding your way around Middle Earth. Each of the major hubs has a capital icon (star) and the places you have been light up. You can click on a stable and it will highlight all the other stable that you can access from there, making this handy for route planning. A side benefit to this “collection” is that you can also use it to determine if you have been in an area to do quests (assuming you are like me and click on a stable-master every time I enter a new area). 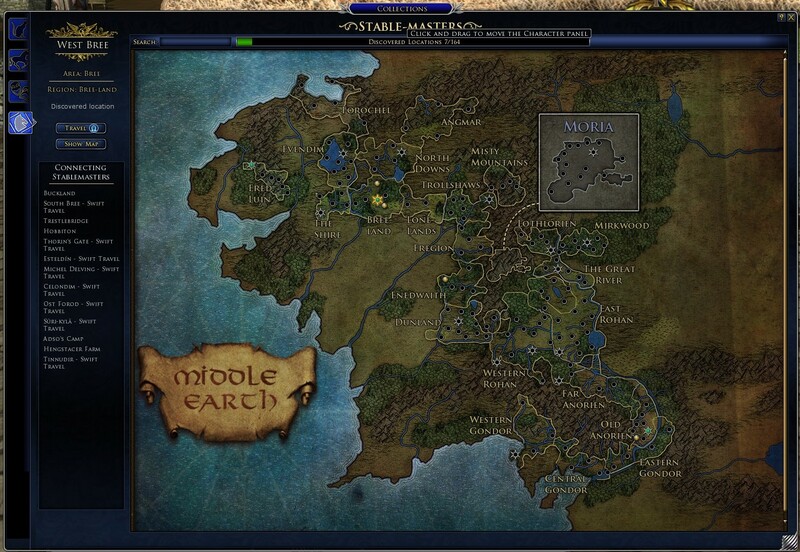 To access the Stable-master collection simply open your world map (“m” key by default) and at the bottom you will see a Stable-master button; press it. Alternatively you can open the Collections panel by clicking Control + Shift + C (default). Read the full Dev Diary HERE.